What a 350ft buffer around the Hoover Building looks like. 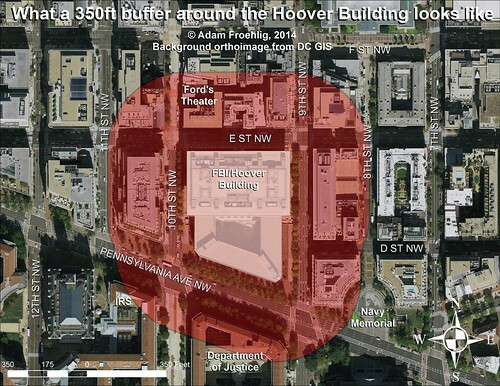 The FBI and the General Services Administration (GSA) are searching for a site to house a new consolidated FBI headquarters, to replace the much-maligned Hoover Building location on Pennsylvania Ave NW in downtown DC. Though it was recently announced that no sites in DC remain in consideration, there are a few who wonder why they don't just reuse the existing Hoover Building site. One of the strong preferences the GSA is considering in site location is that the site would allow for a 350 foot "security buffer zone" surrounding the new headquarters building. Though this is apparently not an outright requirement, the GSA and FBI have made mention that they strongly prefer sites that can offer such a buffer zone. Image by the author. Click on the image for a larger version. As you can see, such a buffer zone around the Hoover Building would seriously impact buildings on almost every block adjacent to the Hoover Building. More notably, it would impact the IRS headquarters, the Justice Department, and especially the historic Ford's Theater. It would also have a minor impact on the Navy Memorial. From a transportation perspective, it would seriously impact E St NW, 9th St NW, and Pennsylvania Ave NW, all major streets in the DC core.